Jack Bell Gallery is pleased to present a body of work by Los Angeles based contemporary artist Karen Hampton. 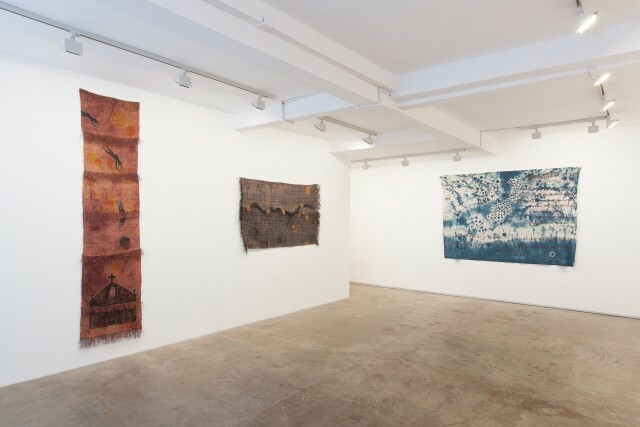 ‘Abolitionists Tale’ brings together a selection of textile pieces, several of which have recently been included in a solo exhibition at the Wellin Museum of Art, USA. This will be the artist’s first show in the UK. Karen Hampton draws on her multicultural heritage to examine the complicated history of America, replete with dreams of freedom and loss resulting from displacement. By employing the traditional arts of hand-stitching and weaving, as well as materials such as indigo, cotton, and raffia cloth that allude to African American culture, Hampton embeds her work with symbols, images, and text that chronicle the stories of her ancestors. Her incisively poignant work speaks to the broader struggle to find one’s own voice and identity in the United States today. Hampton was born in 1958, Los Angeles, USA, where she continues to live and work. The artist has been included in exhibitions at the Muskegon Museum of Art, Michigan; College of Marin, Kentfield; Design Gallery (now the Design Museum) at the University of California, Davis; and San Jose Museum among others. Awards include the Sacatar Foundation Award, the Fleishhacker Foundation Eureka Fellowship, Marin Arts Council Award, and the Ellen Hansen Memorial Prize. Hampton graduated with an MFA from the University of California, Davis.